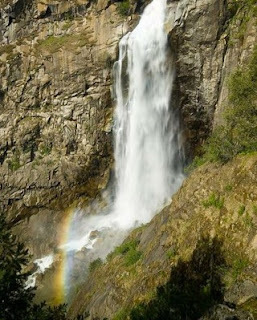 This THP is about 16 miles NE of Oroville, CA and a few miles NE of the town of Feather Falls at an elevation of 3,080 to 4,000 feet. Sierra Pacific Industries is planning a tractor based logging operation in ponderosa pine, sugar pine, Douglas fir, white fir and incense cedar forests. There are 3 unstable areas adjacent to THP units in sections 6 and 7, and a mine shaft in unit T-6. SPI is requesting an exemption from the Butte County Air Resources Board to be able to log inside an area known to have naturally occurring asbestos. They also want to use an existing landing inside a class II (mid-sized) watercourse, and an existing skid trail and landing near a class II wet area. 21 road drainage sites are planned for work including rocking, dip construction, ditch cleaning and repair/replacement of culverts. There is a spotted owl territory adjacent to unit T-2 in section 5, and Humboldt lily was reported to be adjacent to unit T-6. More information is available on the THP Tracking Center website. 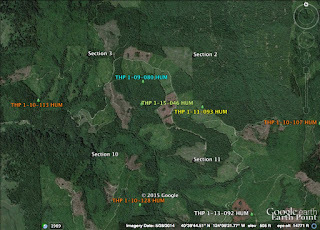 Green Diamond Resource Company planning a pair of clearcut THPs near Trinidad, CA. 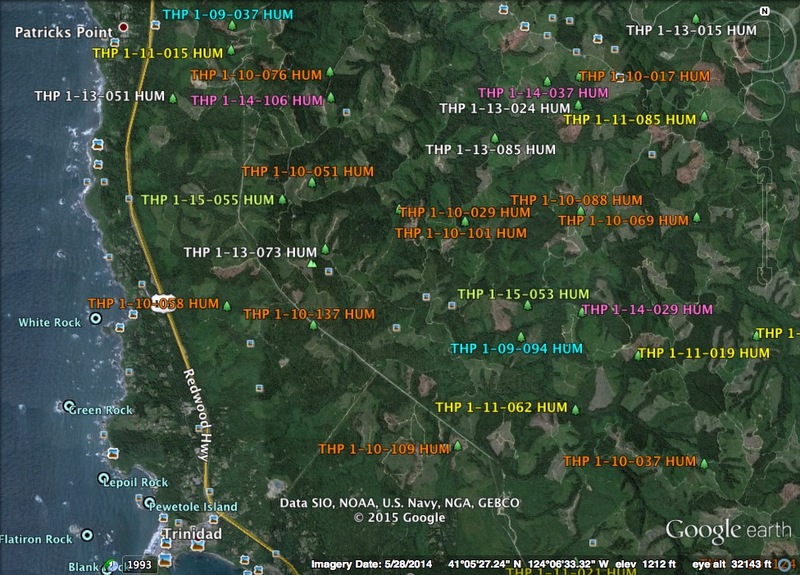 This THP is a few miles NE of Trinidad, CA and Highway 101 at an elevation of 600 to 1,300 feet. Green Diamond Resource Company is planning a mostly clearcut feller buncher, cable and shovel logging operation in Douglas fir, redwood, grand fir, spruce and western hemlock forests. The THP are drains into Maple Creek which drains into Big Lagoon at the Pacific Ocean and contains coho, chinook salmon, coastal cutthroat trout and steelhead. There is 1 shallow rapid landslide terrain site in the southern portion of unit C. Six road drainage sites are planned for work including rocking, dip construction, ditch cleaning and repair/replacement of culverts. There are 2 osprey nests within .25 mi of haul road CR1400, and southern torrent salamanders and tailed frogs were spotted adjacent to units B,C,D,E and F. Spotted owl nesting territories are located within .5 mi of unit B. 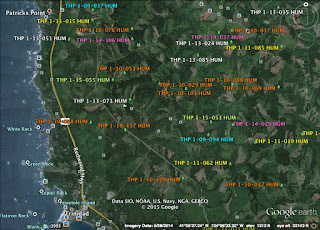 This THP is just SE of Green Diamond Resource Company’s THP 1-15-055 HUM (CR West 1000 16). This THP is a few miles north of Trinidad, CA and Highway 101 at an elevation of 400 to 800 feet. 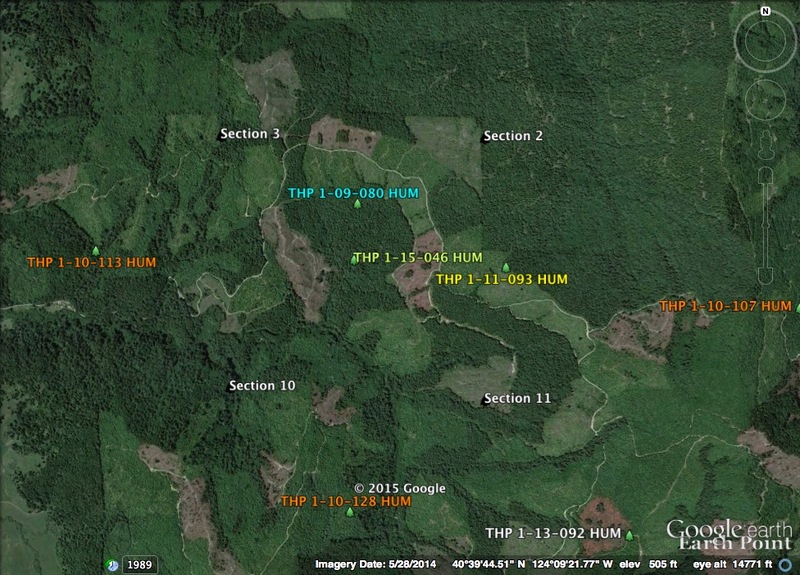 Green Diamond Resource Company is planning a mostly clearcut feller buncher, shovel and cable logging operation in redwood, bishop pine, Douglas fir, sitka spruce and grand fir forests. 4.2 acres adjacent to Highway 101 are designated as a “Special Treatment Area”, and will be lightly logged to hide the effects of clearcutting within unit D. Eight road drainage sites are planned for work including rocking, dip construction, ditch cleaning and repair/replacement of culverts. There is an osprey nest site within .25 mi of the BL3000 haul road. This THP is just NW of Green Diamond Resource Company’s THP 1-15-053 HUM (CR2400 15). More information is available on the THP Tracking Center website. 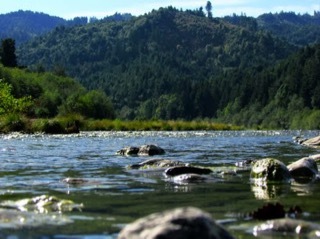 Green Diamond Resource Company to log near the Lower Klamath River. This THP is 9 miles NE of Orick, CA and east of Redwood National Park along the lower Klamath River at an elevation of 420 to 1,280 feet. Green Diamond Resource Company is planning a tractor and cable logging operation on steep and unstable slopes in redwood, Douglas fir, and Western hemlock forests. There is 1 shallow rapid landslide terrain site along the western boundary of unit C, and 3 shallow rapid landslide terrain sites in Unit F located near a class III watercourse, near the lower boundary of unit F, and along the SW corner of unit F by Little Surpur Creek. 7 road drainage sites are planned for work including rocking, dip construction, ditch cleaning and repair/replacement of culverts. Two bald eagle nests are located .16 mi north of unit B, and .5 miles from unit C and haul roads A600 and CL1040. There are 4 osprey nests including 2 nests within .25 mi of unit B, and 2 nests within .25 mi of haul roads A600 and CL1040. Southern Torrent Salamanders and Tailed Frogs were reported to be in Surpur Creek, and Little Surpur Creek. Spotted owl nesting territories are located within .25 mi of units C, E and F, and within .5 mi of units A, B and D. More information is available on the THP Tracking Center website. This THP is a few miles east of Redwood National Park between Orick and Weitchpec near the Bald Hills Road at an elevation of 1,500 to 2,275 feet. Green Diamond Resource Company is planning a mostly clearcut tractor and cable logging operation in Douglas fir and redwood forests. The THP area flows eastward into the Klamath River which is listed as an impaired watershed and contains Coho, Chinook salmon, steelhead and coastal cutthroat trout. There are multiple shallow rapid landslide terrain sites in units B, C and D, and 300 feet of steep temporary road exceeding 20% grade is proposed to access unit E. Seven road drainage work sites are planned for work including rocking, dip construction, culvert repair/replacement and re-construction of washed out crossings. Spotted owl nesting territories exist within .5 mi of Unit C. More information is available on the THP Tracking Center website. Green Diamond Resource Company to log on steep and unstable slopes near Smith River. This THP is a few miles NE of the town of Smith River, CA and Highway 101 near the CA/OR border at an elevation of 500 to 1,650 feet. Green Diamond Resource Company is planning a mostly clearcut tractor and cable logging operation on steep and unstable slopes in in redwood, Douglas fir, grand fir and western hemlock forests. 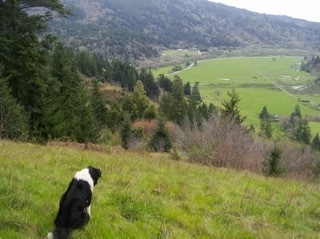 The THP area drains into the South Fork of the Winchuck River and Domaine Creek which flows into the Smith River. There are 4 shallow rapid landslide terrain sites in unit A, and 3 shallow rapid landslide terrain sites in unit E. 11 road drainage sites are planned for work including rocking, dip construction, ditch cleaning, culvert repair/replacement and restoration of washed out crossings. Coho and Chinook salmon, steelhead and coastal cutthroat trout occur in Domaine Creek, and southern torrent salamander and tailed frogs are known to occur in class II (mid-sized streams) in units B,D,E and F. More information is available on the THP Tracking Center website. 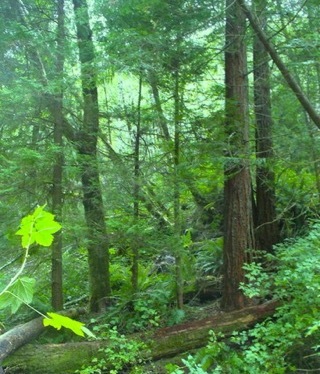 Green Diamond Resource Company to clearcut log trees up to 72” dbh near Klamath, CA. This THP is about 5 miles north of the town of Klamath, CA and about 3 miles east of Highway 101 at an elevation of 300 to 1,600 feet. Green Diamond Resource Company is planning a mostly clearcut tractor and cable logging operation on steep and unstable slopes in a redwood, Douglas fir and hemlock forests. Trees within the clearcut portion of unit E, have diameters of 16-72 inches DBH, with an average of approximately 26 inches. The THP area drains down Hunter Creek to the Klamath River which supports coho, steelhead, resident rainbow trout and coastal cutthroat trout. Shallow rapid landslide terrain is located inside and adjacent to units A,C,D,E and F. There are 4 road failure sites including a an existing seasonal road located adjacent to a cutback slide and outboard fill failure, an existing seasonal road adjacent to an unstable area on a cutback hillslope, a watercourse crossing adjacent to a cutslope slide, and a steep cutslope on a main haul road near the northern boundary of unit C. There are 16 road drainage sites planned for work including rocking, dip construction, ditch cleaning, culvert repair/replacement and restoration of washed out crossings. Spotted owl nesting territories are located within .25 mi of unit E, and .5 mi of units A & D. More information is available on the THP Tracking Center website. Green Diamond Resource Company to log on steep and unstable slopes SE of Korbel, CA. This THP is 4 miles SE of Korbel, CA and Highway 299 at an elevation of 560 to 2,600 feet. Green Diamond Resource Company is planning a tractor and cable logging operation on steep and unstable slopes in redwood and Douglas fir forests. The THP area flows into the Mad River which is listed as an impaired watershed for sediment, temperature and turbidity and contains coho, chinook salmon, steelhead and coastal cutthroat trout. There are 6 landslide terrain sites; including multiple deep seated landslide terrain features along the northern and northeastern portions of unit B, and displacement of existing roads. Green Diamond Resource Company wants to use of an existing skid road inside a class II (mid sized) watercourse for skidding and timber falling operations. There are 17 road drainage work sites including rocking, dip construction, ditch cleaning, culvert repair/replacement and restoration of washed out crossings. Spotted owl nesting territories are located within .25 mi of units A,B,C,D,and E. More information is available on the THP Tracking Center website. 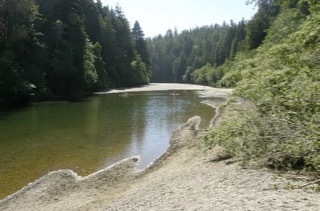 Gualala Redwoods to remove individual trees along the banks of the Gualala River. This THP will remove individual trees along the alluvial flats of the Gualala River and tributaries from .5 mi to 9 miles out from the town of Gualala, CA. 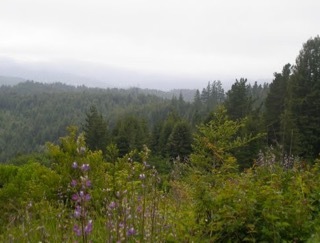 Gualala Redwoods is planning a tractor based selection logging operation in Douglas fir and redwood forests at an elevation of 30 to 240 feet. 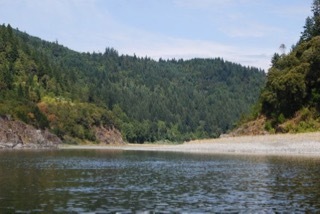 The Gualala River is listed as impaired for sediment and temperature and contains coho salmon and steelhead. Gualala Redwoods wants to use an existing haul road inside a class I watercourse (Gualala River). There are 59 road drainage work sites including rocking, dip construction, ditch cleaning and culvert repair/replacement. A cooper's hawk was reported along the eastern edge of the Gualala River in the THP area. More information is available on the THP Tracking Center website. SAN FRANCISCO (CN) - A federal judge vacated 50-year "incidental take permits" for timber harvesting in Northern spotted owl and Coho salmon habitat in a wilderness area. Plaintiffs' attorney Wyatt Golding told Courthouse News that he and his clients are excited about the May 29 ruling. "It's a win for the spotted owls and Coho salmon," Golding said. "The judge is right that the permits and environmental analysis violated the Endangered Species Act." Designated in 1984, the Siskiyou Wilderness stretches across 182,802 acres and three national forests in Del Norte, Siskiyou and Humboldt counties in Northern California. It is home to several species of conifers, including the rare Alaska cedar, several rare fish and wildlife species, such as the Coho salmon and spotted owl, and a vast array of old-growth forests. In 2009, defendant-intervenor Fruit Growers Supply Company applied to the National Marine Fisheries Service and the Fish and Wildlife Service for 50-year permits to take, meaning to harm or kill, Northern spotted owl and Coho salmon in the course of timber harvesting on company land. Fruit Growers and the federal agencies developed a habitat conservation plan and environmental impact statement purporting to mitigate harm to the animals. The agencies issued biological opinions that concluded the permits would not jeopardize the species or their critical habitats. 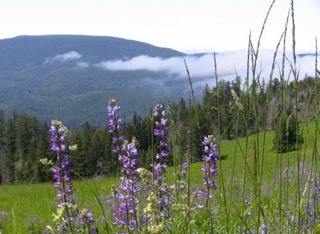 Klamath-Siskiyou Wildlands Center, the Center for Biological Diversity and the Klamath Forest Alliance challenged the permits and the environmental studies in August 2013. Among other things, the groups argued that the documents relied on "speculative" assumptions about the habitat conservation plan's ability to protect spotted owls despite not knowing whether the nonparty U.S. Forest Service planned to log in the sites protected by the permits. The groups also claimed that the habitat conservation plan erroneously concluded that Fruit Growers could protect Coho salmon from sediment discharge though it did not know how much would be discharged. The court found in April this year that the services acted arbitrarily and capriciously in issuing two of the permits based on invalid no-jeopardy findings in the biological opinions and insufficient analysis of the cumulative impacts of the permits in the environmental impact statement.